On its “10 a.m. Special” Tumblr page, The Corcoran Group showcases one jaw-dropping listing every day. The posts are bursting with a colorful mixture of new media that includes clickable photos and graphics, embedded videos and invitations to follow Corcoran on Pinterest, YouTube and Foursquare. Highlighting the full range of content and social platforms made possible by the Internet, Corcoran’s “10 a.m. Special” Tumblr page paints a picture of how brokers and agents may use the blogging site to market themselves and their properties. Many real estate professionals and businesses may soon follow in Corcoran’s footsteps. The acquisition of Tumblr by Internet giant Yahoo could spark more interest in the platform, by raising awareness of a site that simplifies blogging and potentially providing professionals with a means to target millennial homebuyers and sellers, according to social media consultant Katie Lance and other experts. Tumblr, a social media blogging site known for its spirit of millennial irreverence, resembles something of a cross between Facebook and Twitter. On Monday, Yahoo confirmed that it plans to purchase the site for about $1.1 billion in cash, with its CEO promising “not to screw up” the site. The purchase has drawn comparisons to Facebook’s acquisition of photo-sharing site Instagram in April 2012. That acquisition, Lance said, initially raised fears that the site would shed some of its hip allure. But instead, Lance said, it seemed to raise awareness of the site and attract additional users. Indeed, Instagram’s users, engagement and reach for brands have increased substantially since Facebook bought the site, TechCrunch reported. Lance said that Yahoo’s purchase of Tumblr could run a similar course. “All of a sudden you hear Yahoo is behind it, and I think for a lot of people, sometimes that older generation, it’s like giving a company validity,” she said. And if it does, that could potentially spark a resurgence in blogging among business professionals, including real estate agents, who have largely exited the blogosphere following a “big push” there about five years ago, she said. 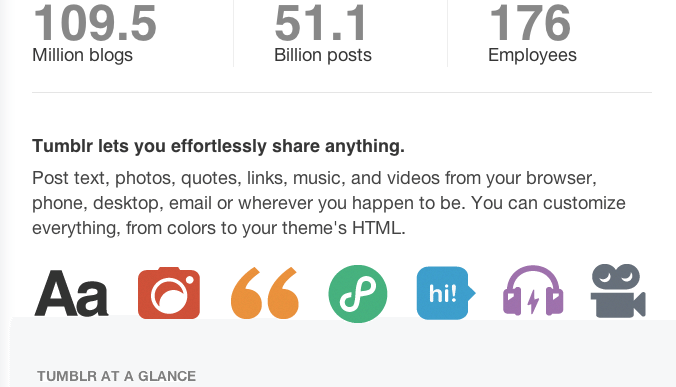 That’s because Tumblr is much easier to use than other blogging platforms like WordPress, Lance said. Perhaps Tumblr’s “biggest differentiator” is its “reblog” feature, which allows users to share content produced by others, she added. But whether Tumblr really makes blogging more manageable than other platforms is still a matter of debate. Facebook page “Living in Ann Arbor,” which is sponsored by broker Ann Arbor Real Estate, said on Inman News’ Facebook page that Tumblr is actually more challenging to use than platforms like WordPress and Blogger. “The Tumblr editor interface isn’t as good as WordPress.com or even Blogger.com if you are going the free route” and “want to gain a social following and share your posts freely,” Living in Ann Arbor said. Regardless, with the site now in the limelight, many business professionals may also begin to gravitate towards Tumblr in order to fish for millennial buyers and sellers, since the site “tends to skew a lot younger” than other social media sites, Lance said. He called Tumblr an “incredibly effective” advertising tool, and said the company’s blog represents its largest social media presence, boasting over 115,000 followers and collecting new ones at a rate of 500 a day. In addition to potentially shedding light on a new avenue for agents to intersect with younger homebuyers and sellers, Tumblr could open up promising paid-advertising opportunities. One of Yahoo’s main objectives is to milk Tumblr for advertising revenue. Yahoo CEO Marissa Mayer said Yahoo would initiate that process by putting ads in the Tumblr “dashboard,” a content stream much like Facebook’s News Feed, The Los Angeles Times reported. Later, Yahoo might allow users to post ads on their blogs themselves, and share revenue earned through the ads with Yahoo. “If an agent is really trying to focus on millennials or first-time homebuyers, specially in a specific geographic area, I think that could definitely be an opportunity,” Mayer said, according to the Los Angeles Times. What do you think about Yahoo’s acquisition of Tumblr? Leave your comment below.